Who should not take Depakote Sprinkle? Take this medication by mouth as directed by your doctor. You may take it with food if stomach upset occurs. This medication may be swallowed whole or the capsule can be opened and the entire contents sprinkled onto a small amount (teaspoonful) of soft food, such as applesauce or pudding. Drinking water right after taking the sprinkle and food mixture will help make sure all sprinkles are swallowed. If you spill any of the contents, discard it and start over with a new capsule and another portion of food. All of the drug/food mixture should be swallowed right away (do not chew). Do not save for future use. Divalproex sodium does not relieve acute migraine headaches. Take other medications as directed by your doctor for acute attacks . What conditions does Depakote Sprinkle treat? If you notice coated particles in your stool, they are harmless. These specially coated particles do not completely dissolve and may be passed in the stool. Get medical help right away if you have any very serious side effects, including: chest pain, easy bruising/unexplained bleeding, fast/slow/irregular heartbeat, swelling of hands/feet, uncontrolled eye movement (nystagmus), feeling cold/shivering, rapid breathing, loss of consciousness. List Depakote Sprinkle side effects by likelihood and severity. Before using this medication, tell your doctor or pharmacist your medical history, especially of: liver disease, pancreatitis, certain metabolic disorders (such as urea cycle disorders, Alpers-Huttenlocher syndrome), alcohol abuse, bleeding problems, brain disease (dementia), kidney disease, low body water (dehydration), poor nutrition. What should I know regarding pregnancy, nursing and administering Depakote Sprinkle to children or the elderly? Some products that may interact with this drug include: certain antidepressants (e.g., amitriptyline, nortriptyline, phenelzine), certain antibiotics (carbapenems such as doripenem, imipenem), mefloquine, orlistat, other medications for seizure (e.g., ethosuximide, lamotrigine, phenytoin, rufinamide, topiramate), rifampin, vorinostat, warfarin, zidovudine. Tell your doctor or pharmacist if you are taking other products that cause drowsiness including alcohol, marijuana, antihistamines (such as cetirizine, diphenhydramine), drugs for sleep or anxiety (such as alprazolam, zolpidem), muscle relaxants (such as carisoprodol, cyclobenzaprine), and narcotic pain relievers (such as codeine, hydrocodone). Does Depakote Sprinkle interact with other medications? 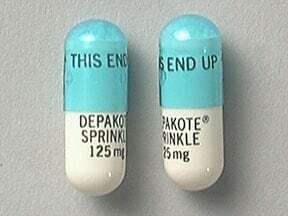 This medicine is a white blue, oblong, capsule imprinted with "THIS END UP" and "DEPAKOTE SPRINKLE 125mg". Are you taking Depakote Sprinkle? Are you considering switching to Depakote Sprinkle? How long have you been taking Depakote Sprinkle?